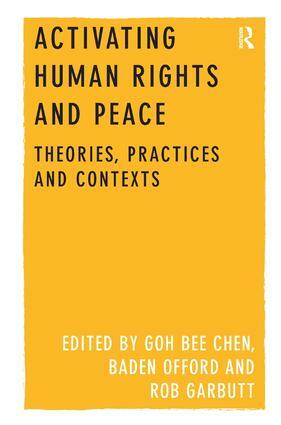 Contents: Foreword; Preface; Activating human rights and peace: an overview of theory, practice and context, GOH Bee Chen, Baden Offord and Rob Garbutt; Part I Theories: Karmic wisdom and international law, incorporating the proposed international Peace Charter, GOH Bee Chen; Peacebuilding education: enabling human rights and social justice through cultural studies pedagogy, Baden Offord and John Ryan; Beyond the modern synecdoche: towards a non-fundamentalist human rights discourse, Riccardo Baldissone; New wars - old wars: thinking creatively about the prevention and transformation of violent conflict in the 21st century, Kevin P. Clements; Voices for hope: story-telling and human rights, Janie Conway-Herron. Part II Practices: Cambodia: the long hard journey to peace and human rights, Michael Kirby; International recognition of autonomy for indigenous populations: the case of Tibet, Michael C. Davis; Human rights and the Beijing Olympics, Sev Ozdowski; Everyday peace, human rights, belonging and local activism in a 'peaceful' nation, Rob Garbutt; Mediation, Human rights and peace-building in the Asia-Pacific, Dale Bagshaw. Part III Contexts: A clash of paradigms for asylum seekers: border security and human security, Linda Briskman; The war against terror: religion, clothing and the human right to peace, Adrien Katherine Wing; Women, peace and securing human rights, Elisabeth Porter; Intimate violence as human rights abuse: re-framing intra-familial violence against women and children, Jennifer Wilson; A pedagogy of peace: the tourism potential, Lynda-ann Blanchard and Freya Higgins-Desbiolles; Activating human rights and peace: observations and reflections, GOH Bee Chen, Baden Offord and Rob Garbutt; Index.